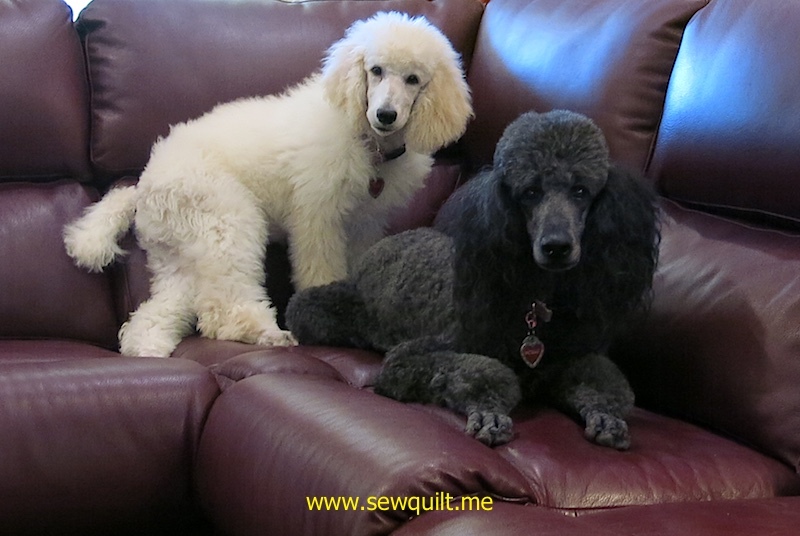 The girls got groomed on Monday which is always a good time for a poodle photo shoot. 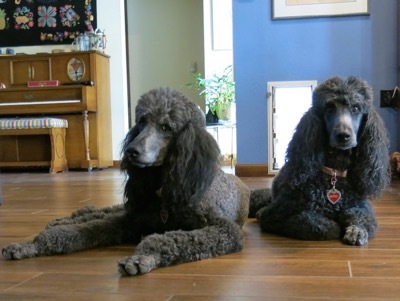 It was not easy to get 2 poodles posed and I was thinking posing 3 poodles might be impossible. I actually got some great pictures of Katie, Molly and Lillie. 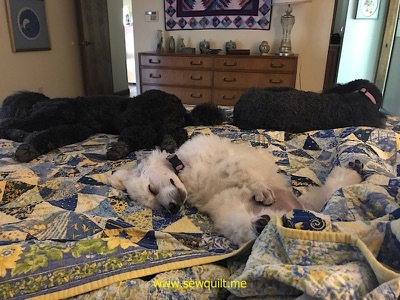 2 black poodles and 1 white poodle equals a poodle Oreo cookie! The girls were amazingly cooperative of posing for me however Lillie did decide that she needed to climb over Molly. 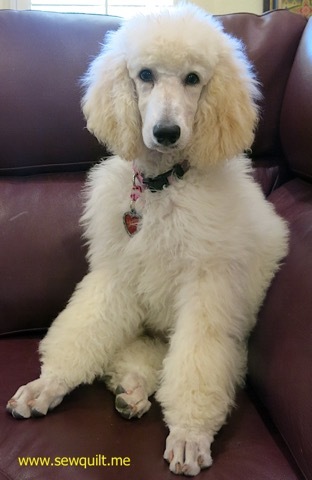 Lillie is now 15 weeks old, she seems to get bigger each day. She weighs 22 pounds and is 15 1/2" at the shoulders. Lillie is a sweet puppy and keeps Katie and Molly on their toes. 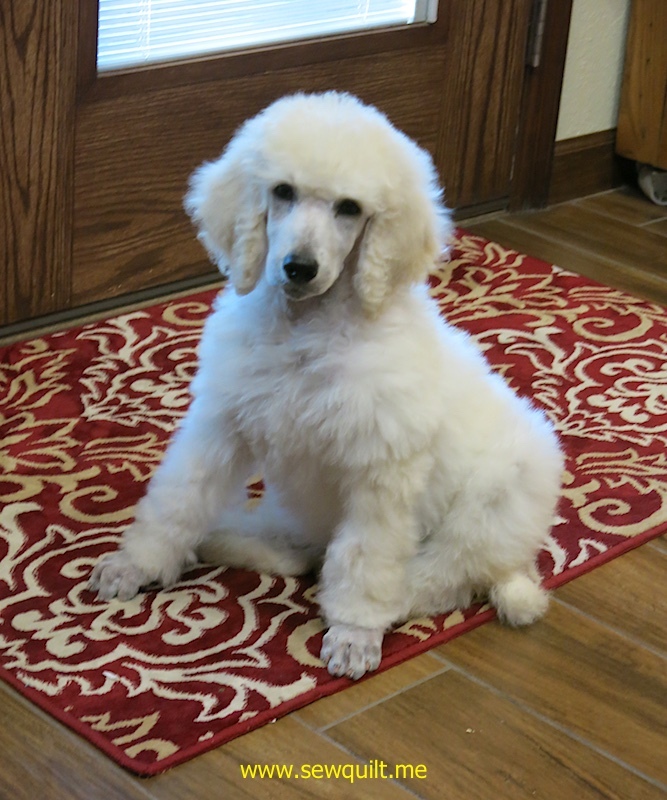 I have not posted for a while, web site needed a major update plus I have a new puppy. Lillie was born on June 4, 2017 and I brought her to my home on Saturday, August 12th when Lillie was almost 10 weeks old. 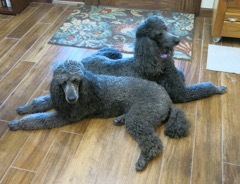 Chrissy, Lillie's mother, is Molly's litter mate, so Molly and Lillie are aunt and niece. Molly had a tough time excepting Lillie as a new sister but after a 5 day snit, Molly and Lillie became friends. After 5 weeks, Molly and Lillie are now almost inseparable. Katie, who turned 11 years old on September 2, 2017, leaves most of the puppy sitting duties to Molly but still has accepted Lillie as a permanent member of the family. About 3 weeks ago, Molly was looking out the living room windows and barking. Molly is on alert, it is a cul de sac EMERGENCY! Molly is getting more agitated. I get up to check out this cul de sac emergency. I don't see anyone walking on the sidewalk, I don't see any vehicles, I simply do not see anything which would cause Molly and Katie to be on hyper alert. Molly and Katie continue to look out the living room windows and barking. I go to look out the window again and this time I see the cul de sac emergency. 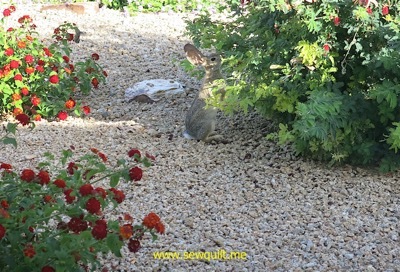 It is a rabbit, a cute little cottontail rabbit. 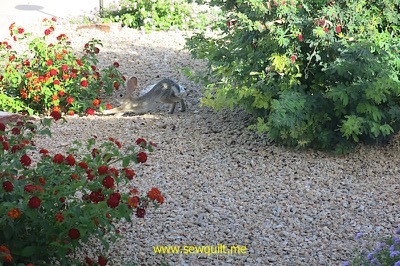 I live very near the North Mountain Preserve but a rabbit in my cul de sac does not seem possible. The rabbit would have to exit the preserve and then hop about an eighth of a mile down Central Avenue to get to my cul de sac. 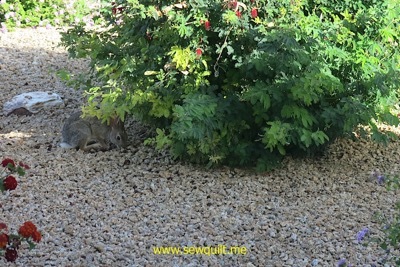 It appears that the rabbit has taken up residence in my cul de sac which is definitely causing Molly and Katie extreme angst. Yesterday, I was able to get a few pictures of rabbit. This week has not been the best. 11:30 Monday night I was at the emergency room after noticing the beginnings of a rash. Yes, I have shingles and yes, I did have a shingles shot 2 years ago. Sometimes life is just not fair. I am doing much much better, I firmly believe that starting anti-viral medication so quickly has definitely ease the course of the infection. Friday afternoon I received a small package in the mail from my quilting buddy, Sandy which did wonders for lifting my spirits. I also should thank Katie and Molly for their excellent nursing care this last week. They definitely deserve some time to rest after some non-stop nursing care. Katie and Molly are good buddies and they have really brought out the best in each other. Katie is 7 1/2 years old and Molly is 4 years old. Molly loves everyone while Katie is a bit more selective, but with Molly leading the way, Katie has become more outgoing. It is not often I am able to take a picture without either Katie or Molly deciding to move. 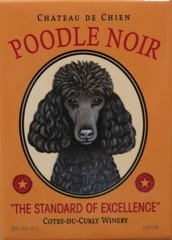 I usually end with a picture of one poodle and one black furry blur. Katie is on the right and Molly is on the left looking much serious than she really is. My quilting buddy, Sandy, came to Phoenix to take some classes at Quilting in the Desert. She took this picture of the girls waiting, oh so patiently, for a piece of pizza crust. 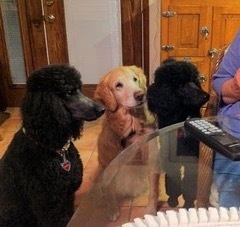 Pizza crust is the only thing that they all beg for. 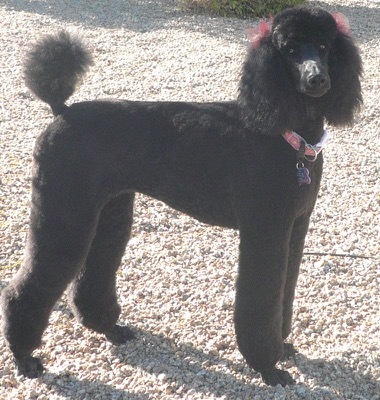 Katie, my standard poodle, is now 4 years old. Katie has now become quite the expert in counter surfing and basket trashing. Katie is continuing the proud tradition of guarding the house and keeping all dragons and dinosaurs from the backyard.